Princess Polish: HOLIDAY GIFT GUIDE: Dura-Tags + A Giveaway! Hello, everybody! 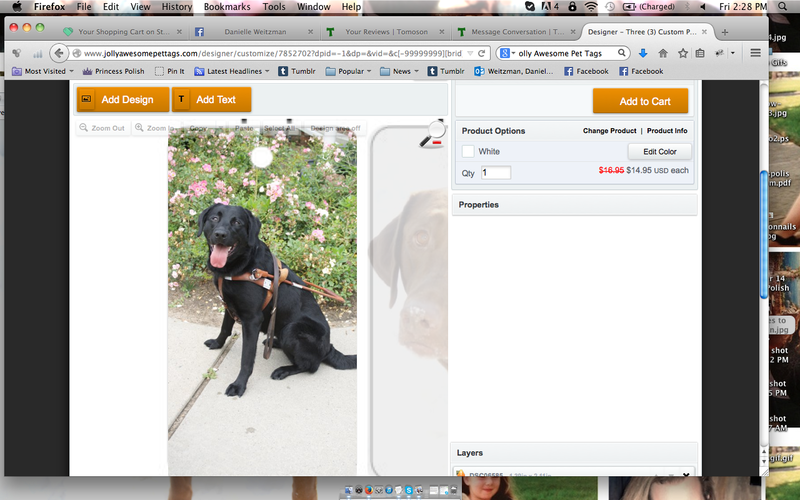 Today I have a REALLY cool product to show you called Dura-Tags! 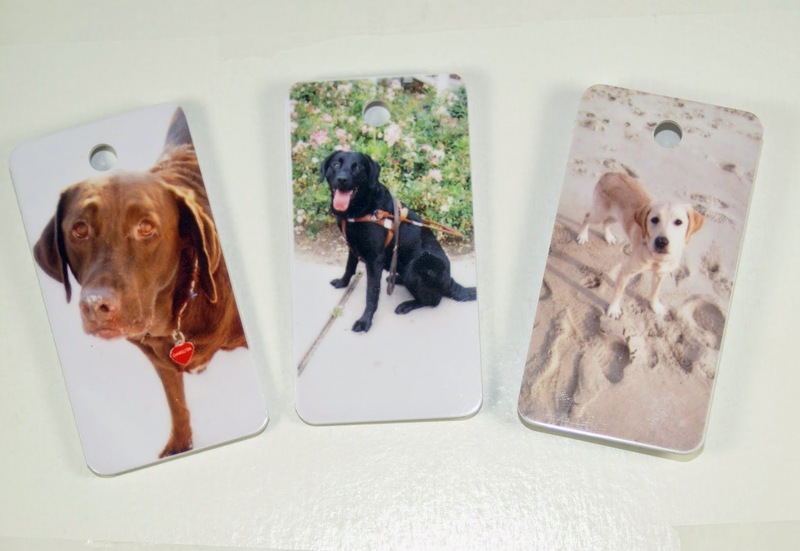 I was given the opportunity to design three of my own custom photo tags, which was perfect because I have three Labrador Retrievers! But you don't have to own a dog for a Dura-Tag. Any pet will do... a cat, a horse, a bird, a fish... even a pig! Keep reading to see this awesome product that's perfect for the holidays and a chance to win three free Dura-Tags! The website is very easy to use. After selecting either a single tag or the trio of tags (I picked the trio) an interface like the one below will pop up. The rectangles will be blank. Each column represents one tag, with the top rectangle (letter F) being the front and the bottom rectangle (B) being the back. As you can see below, the each dog's picture matches up with their name (F1 and B1, F2 and B2, F3 and B3). To add/change the design, click on the rectangle you wish to change. If you're putting an image of your pet on the front (like I did), be sure you have a high quality image that you can scale to cover the whole side. It's okay if the dimensions are bigger than the tag. You can move the image around to get it placed just how you want it. When you're done, click on the next tag or side you want to edit. 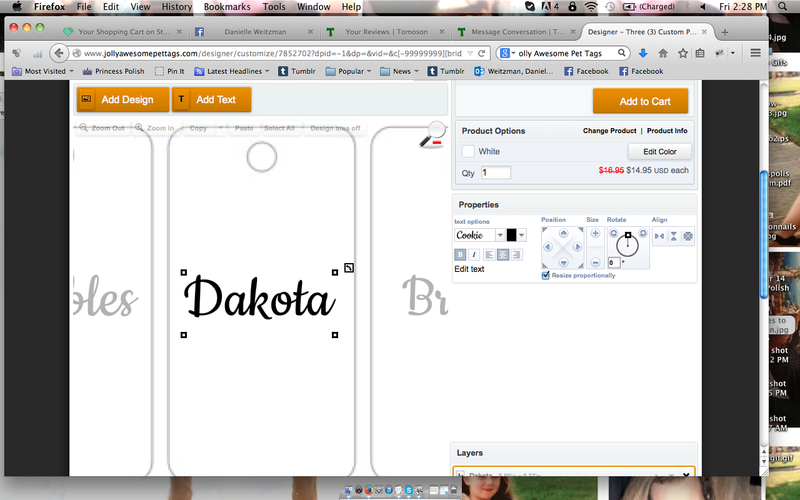 Below, you'll see that I typed just Dakota's name in a cursive font I liked. Because I'm obsessed with having these on my keyring, I didn't need to include an address and phone number. However, since most people will use them as pet tags, you can edit the text accordingly. Once you're satisfied with the way the front and back look, add your product to the cart, check out, and wait for your lovely tags to arrive in the mail! And voila! Here are my three tags! As you can see, the colors are pretty vivid. The photo of Dakota is outside in the snow, Pebbles is in harness near a garden (Seeing Eye retiree, remember?!? ), and Brynn is on the beach. Because two of my dogs are darker colors and the other is a closer color to her surroundings, you can see the contrast and saturation of the colors is pretty true to form. Dakota's and Pebbles's features are highly visible and I can easily distinguish Brynn from the sand. My apologies for the slightly darker photo, but it was difficult to capture the tag when it's white on a white background. The only thing that I wasn't thrilled with is that the text on the back of the tag looks a bit pixelated in person. It's not jagged to the point where it's illegible and I suppose it's because I made the font sizes of all three names bigger than intended because I only needed the names. However, I don't think that's a big enough reason not to purchase these. Replace your tag for free if it gets lost. Replace your tag for free if it becomes damaged to the point where your ability to recover your pet may be hindered. Offer you a new tag at a discounted rate if your information changes (such as a phone number or address) to ensure your pet has updated tags. Warranty your tags against breakage or delamination for up to a year. AND offer a 30-day money back guarantee if you're not satisfied with your purchase. I have THREE Labrador Retrievers and find myself replacing their metal tags at least once a year because the etching fades to the point of being illegible. Even the most plain and simple tags cost $9.99 a piece at Petco/Petsmart. So this is probably going to save me at least $30 a year in tag replacements. Even if I do have to replace them, it'll still cost at least 50% less with Dura-Tag. 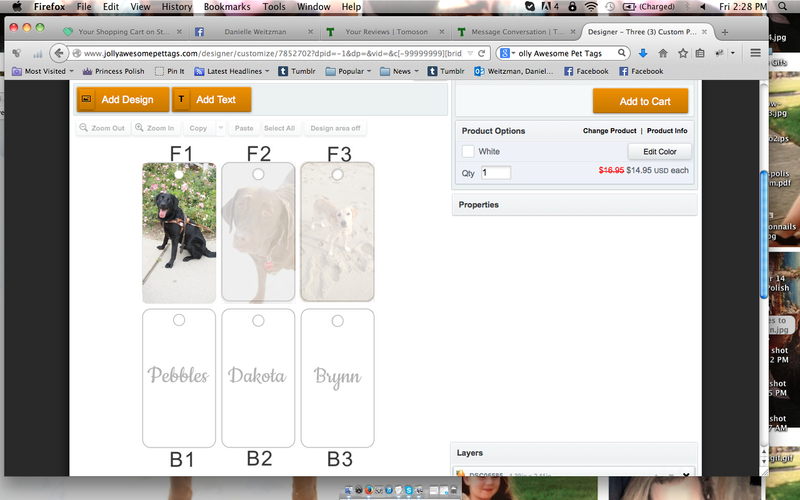 Also, the website allows you to save your designs, so they're easy to reorder or order another one for a family member! Additionally, these are incredibly quiet. Metal tags constantly jingle. Which isn't a big deal until it's 2am the night before a Corporations Law final and your yellow lab decides she's going to go on a scratching spree. Need I say much more? Didn't think so. Did I mention they're waterproof? And my labs are SWIMMERS, so that is a nifty feature. This is a PERFECT holiday gift for any animal lover in your family or circle of friends as a keychain or to buy your own pets for their collars. Never again will you have to dig for your phone to show off your pets. Just pick up your keys! As I mentioned earlier, the trio of tags is currently on sale for a limited time for $14.95 (regular price: $16.95) at the Dura-Tags website. You can also purchase a single tag for $12.95, but clearly, the trio is the better value. In addition, you can purchase a gift card for $16.95 to give as a present to someone, which will cover the trio of tags! And what do you know? I have a gift card for $16.95 to giveaway today! Enter below! The giveaway ends on Sunday, November 23rd at 11:59pm EST! Good luck! These look really cute! 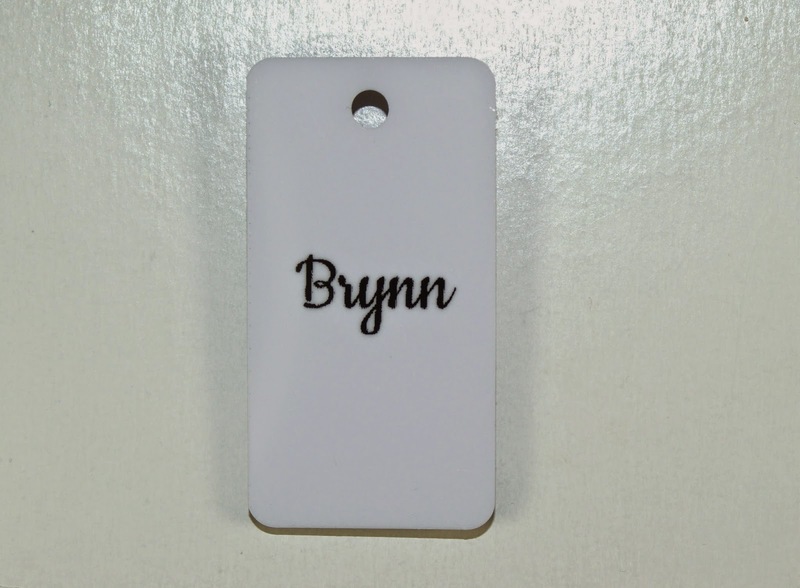 Since I'm adopting Freckles back soon, I've been searching for new tags!